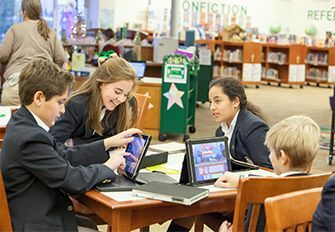 Saint Patrick Catholic School’s unique curriculum focuses on developing the whole child, socially, academically, and spiritually. Students are taught the necessary skills and concepts to be successful in school and in life through curriculum and programs that inspire student motivation and foster autonomy in self-reflection and decision-making leading to the aspired Graduate at Graduation. According to Catholic tradition, the school curriculum encompasses the principles of respect, challenges learners to achieve their potential, and contributes to their moral development. Both the lower and middle school program of studies help stimulate the development of critical and creative thinking, clarity of thought and expression, leadership, and problem solving. The program also includes opportunities to foster service and develop an appreciation for music, art, movement, and world cultures. Teachers at Saint Patrick Catholic School act on the belief that every student can learn a challenging curriculum with appropriate differentiation. As such, teachers are committed to providing engaging, meaningful, varied classroom instruction that best meets the needs of all learners.